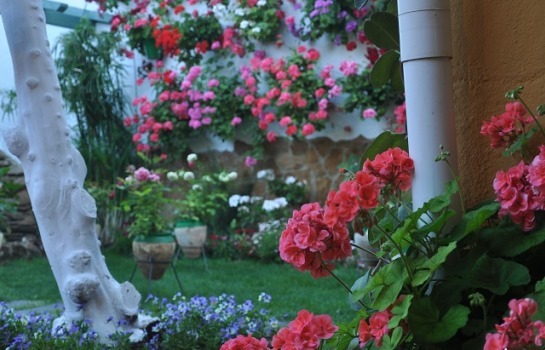 The town of El Carpio is famous for local events such as Scarpia or Muestra Nacional de la Mantilla, but has an excellent reputation for its beautiful patios which are known even beyond the boundaries of Andalusia. El Carpio is located about 30 kilometers (20 miles) east of the provincial capital of Cordoba. Situated just off the A-4 highway connecting Madrid and Cadiz, El Carpio is well-connected and quiet perfect for a side trip. Historically, El Carpio became important at the time when the Christian re-conquered Spain. Though there is indication of the beginings of the settlement lasting back as far as to the first century before Christ, reliable evidence dates from the 15th century. At that time El Carpio gained importance due to its strategic location. El Carpio’s present appearance goes back to that time. Protected by the massive fortress, the town experienced a strongly development. However, the ancient stronghold’s Garci Méndez Tower and scattered structures are the only rests remaining at present time. This impressive three-story tower was built in the early 14th century by lord Garci Méndez de Sotomayor. The Mudejar style structure is one of the most interesting examples of Andalusian military architecture. Originally, the tower was the keep of the ancient castle, where the town of El Carpio had its origins. This parish is of artless appearance, but its interior has several gems making it worth a visit. Especially the haunches, adorned by the emblem of the margraves of El Carpio, and the crypt under the main chapel should not be missed. Found at the central Plaza de la Constitución (Constitution Square), the so-called Palacio Ducal (Duke Palace) is another highlight in town. Built in 1671, the spacious complex is made of three sections. The center part was the actual mansion, while the side tracts harbored accommodation for the staff. Currently, the buidling is a municipal facility used for cultural activities. Recently renovated, the Municipal Theater is harbored by a building adjacent to the Garci Méndez Tower. Erstwhile the vault served as the castle granary. Not far from El Carpio, located at the banks of the Guadalquivir River near the ruins of Castillo de Alcocer, there is a water hoist. It was built between 1561 and 1568 to lift water from the river to elevated acreage. Found outside of the town at the left shore of the Guadalquivir there is a tiny chapel covered by a tunnel vault. Its plain interior blends harmonically with geometric stuccowork. Located right between the towns of El Carpio, Pedro Abad and Adamuz, there is a dam impounding the water of the Guadalquivir. Designed to generate electricity from the power of the water, the dam also serves as a crossing of the river. The large crossing gate, shaped like a horse-shoe arch, with a polygonal tower gives the dam a peculiarity of its own. Just as in most towns and villages of Andalusia, many El Carpio homes have one or more courtyards (the so-called Patios), one of the main elements of traditional architecture of that region. The special charm provided by these special places is honored every year, when the provincial Patio contest is held. on the occasion of the 2017 edition of the contest, the patio of the house Calle El Centro 22 received the first prize. 3 May: Pilgrimage honoring Nuestro Señor Ecce Homo (Patron of El Carpio). El Carpio is located about 30 kms (20 mi) east of the provincial capital of Cordoba, just off the A4 national highway. Travel time from Cordoba is approximately 20 minutes. To get there, take exit 374 (El Carpio). There is a bus connection between Cordoba and El Carpio. The route between Córdoba and El Carpio is operated by Rafael Ramírez bus company.